The Cooler Master GeminII M4 uses the direct contact method of shifting heat awat from the CPU. Instead of the heatpipes passing through the contact base, in this method they are flattened and become an integral part of the bottom of the contact plate, directly touching the heat shield on the top of the CPU. To get to its amazingly low height profile (just 59mm tall) the cooler uses four standard 6mm U-shaped heatpipes but turns them on their sides to allow for a more compact design. 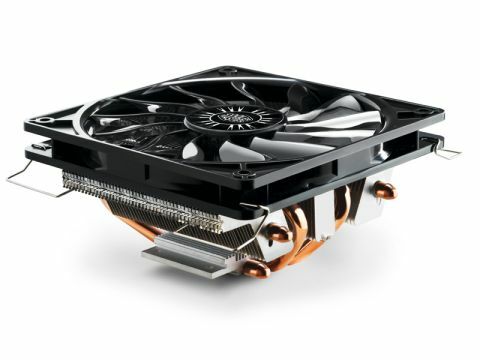 And the newly-designed XtraFlow 120mm fan sitting on the top of the cooler is just a mere 15mm thick. As you can see from the figures, the GeminII M4 isn't a cooler designed to be used in heavy overclocking situations and to be fair to Cooler Master it doesn't make claims that it is. A 2600K maxes out at around 98ºC and while the GeminiII M4 has no problems keeping the CPU cool even under load at stock speeds, it's a different story when the core is overclocked and under load. The M4 struggles to hit 85ºC, which is a tad high for continuous use. The compact design though is a godsend for people who want to put standard, high voltage, processors in the confines of a smaller case. As can be seen from our test results, the GeminII M4 works just fine. It's also pretty quiet in operation too.